So, I already told you that I’m rubbish at keeping up a good routine for something like the minimalism game. Luckily it doesn’t prevent me from getting rid of things, just weeks later instead. Last weekend I went back home to visit my parents. When I moved abroad, I left a lot of stuff at their place. Crate after crate of clothes, shoes and household items from my student days. 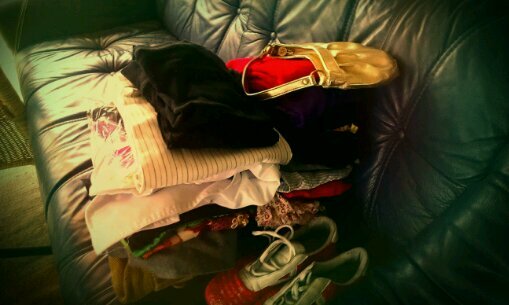 I went through most of my things and managed to get rid of four bags of clothes for charity, as well as throwing away another bag of things. In the ocean of things, it wasn’t much, but decent enough as a start. I also brought a sports bag of things with me back, with a few items to sell or give away, and the rest to replace worn out things I have here. I know that I could have been tougher on myself on that part, but most importantly is that the items now will come to use. If not, they will have to go as well. I feel quite good from doing it, not only for my own sake, but also releasing my parents from some of my (to them especially) useless stuff. I encourage you to do a wardrobe cleanup as well. Good luck!